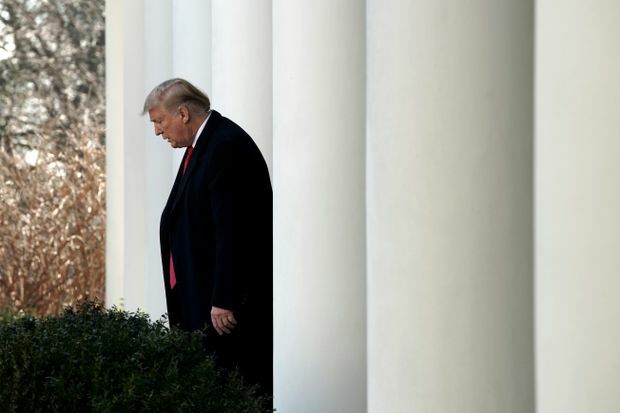 U.S. President Donald Trump arrives to speak at a press event in the Rose Garden of the White House on Jan. 25, 2019. President Donald Trump has capitulated to political pressure and ended the longest government shutdown in U.S. history, agreeing to a temporary spending bill that does not contain money for his promised wall on the Mexican border. The deal will fund the government until Feb. 15, while a bipartisan committee works on a border-security package. The resolution to the 35-day standoff is effectively what the Democratic opposition had proposed from the start. What happens after the middle of February, however, is uncertain. Democrats have vowed not to fund Mr. Trump’s wall. For the President, however, the barrier was the main promise of his nationalistic election campaign. Announcing the deal in the Rose Garden of the White House Friday afternoon, Mr. Trump said he might declare a state of emergency and redirect money from the Department of Defence to build the wall. Such a move would almost certainly face a court challenge over the limits of presidential power. The deal could also leave the President weakened with his base. And it allows the Democrats, who took control of the House of Representatives earlier this month, to claim an early victory as they use their newfound power to try to curtail the President and set the national agenda. Mr. Trump, after public urging by right-wing pundits such as Ann Coulter and Rush Limbaugh, triggered the shutdown the week before Christmas by rejecting a government funding plan negotiated by his own Republican Party. The move left 800,000 government workers without pay for more than a month. The President insisted he would not reopen the government until Congress approved US$5.7-billion for the wall. Democrats remained firm. Speaker Nancy Pelosi described Mr. Trump’s wall as “an immorality” and insisted that the President first agree to reopen the government before she would negotiate on border security. She also postponed Mr. Trump’s State of the Union address, which was set for the U.S. Capitol Tuesday. “It’s sad that it’s taken this long to come to an obvious conclusion,” she said Friday. Ms. Coulter, meanwhile, laid into Mr. Trump on Twitter. “Good news for George Herbert Walker Bush: As of today, he is no longer the biggest wimp ever to serve as President of the United States,” she wrote shortly after the deal was announced. Peter Hanson, an expert on the politics of Congress at Grinnell College in Iowa, said the best the President can hope for now is some deal with the Democrats that offers new funding for border-security measures – such as drones and sensors – without the wall. “It really looks like a complete surrender by the President,” Prof. Hanson said. Still, waiting until the Democrats controlled the House to force the issue does give the President a credible way to explain why he failed. As the shutdown dragged on, the pressure mounted on Republican lawmakers, who grew increasingly frustrated with the President. Polls showed a majority of voters lay responsibility for the crisis at the feet of Mr. Trump and the GOP. Air-traffic controllers and airport security staff, working without pay, began calling in sick, leading to long lineups at airports and numerous flight cancellations. Internal Revenue Service employees threatened to delay the processing of tax returns. Food-safety inspectors were off work. And subsidized housing programs began running out of money, raising the prospect of mass evictions. In addition, FBI director Christopher Wray publicly complained about his agents having to investigate crimes without pay. “It’s mind-boggling, it’s shortsighted, and it’s unfair,” he said in a video message Friday. It also did not help that the Trump administration often seemed tone deaf to the problems the shutdown was creating. When Commerce Secretary Wilbur Ross, whose estimated net worth runs into the hundreds of millions of dollars, was told in a television interview this week that government employees were visiting food banks, he said he was perplexed.